Many companies use flammable liquid chemicals as part of their normal operations. Proper storage of these hazardous chemicals ensures a safe environment. 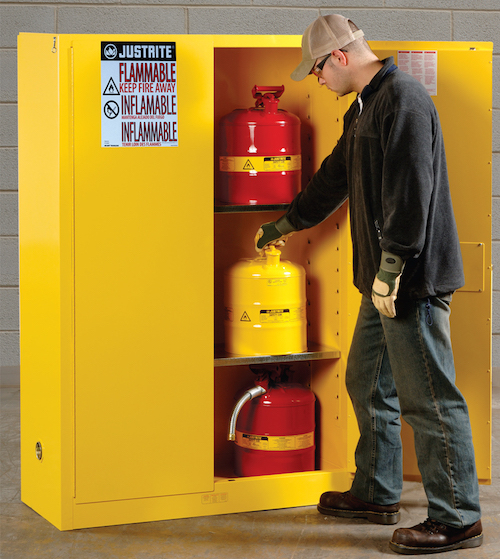 Justrite approved safety cabinets allow companies to store limited volumes of flammable liquids within their workspace. The cabinet construction protects its contents from fire, allowing people time to evacuate the building, and firefighters time to extinguish the fire before it reaches the chemicals. But no matter how well the cabinet is designed, if the doors are left or propped open, the safety benefits cease to exist. For fundamental good safety practices, safety cabinet doors should be closed when the cabinet is unattended. In reality, people often leave cabinets open, doors ajar with the flammables exposed. Here Justrite safety cabinets with self-closing doors provide advantages. When used properly as designed, safety cabinet with self-closing doors shut automatically in case of a fire. The self-closing doors, under tension, are held open by using fusible links. Under fire conditions, when the ambient temperature reaches 165 F (74 C), the links melt and the safety cabinet’s self-closing doors automatically swing shut. The self-latching system engages with three stainless steel bullet-slams located at the top, bottom, and center locations of the door. With the doors fully closed and secured, the safety cabinets protect as designed. The self-closing doors on the safety cabinets are held open by the fusible link as shown. During a fire, the fusible link melts away and the three-point stainless steel bullet latching system creates secure protection. OSHA federal law and NFPA standards govern the construction and safety features of safety cabinets. Designed to keep the inside temperature comparatively low, Justrite safety cabinets feature 18-gauge (1-mm) double-walled welded steel construction that provides 1-1/2 inch of insulating air space. This protects flammable chemicals inside the cabinet, from a fire outside. All Justrite steel safety cabinets comply with OSHA and NFPA codes, and most are independently fire tested and approved by FM Global or other third-party certification agencies for safety performance and compliance to code. Keep in mind that regulators change local standards over time. Since safety cabinets are long-term investments, consider buying a cabinet with self-closing doors now, to ensure compliance with future legislation. Justrite manufactures a wide selection of self-closing safety cabinets, backing their performance with a ten-year limited warranty. With over 300 models ranging in capacities from 4- to 115-gallons (15- to 435 liters), you can rest assured of getting the highest quality and protection from the best safety cabinet for your specific needs. View all our safety cabinets. Hi, Matthew, that’s a great question. While we do offer conversion kits for safety cabinets (manual to self-close doors) for some of our cabinet sizes, it’s important to note that this type of modification of a safety cabinet will void both the cabinet’s FM approval and the Justrite warranty. The craftsmanship of the person retrofitting it can also jeopardize safety. As a best practice, we always recommend using self-close safety cabinets when storing flammable liquids. Do you offer retrofit kits that would allow our fire cabinets to self close?